-Rentals are priced for up to a 24 hour rental period (Not including delivery day and pickup day). Each additional day is 50% off. -Promotions can not be applied to existing orders. -All balances will be due cash upon delivery or you can pay the balance using your credit card via payment link on your emailed invoice. -Deposits will be forfeited for any canceled orders. Any additional payments will be held for 356 days as store credit towards any future orders. -Other rentals canceled within 2 days of your event will be subject to a 50% restocking fee. -All rentals are delivery only. Delivery fees may apply. Rentals are typically delivered the day before and pick up the day after your event. (Delivery dates and times are subject to availability). NOTE: DELIVERY SERVICE HOURS WILL BE EXTENDED IN OUR BUSY SEASON. Our team will inform you if any changes have been made to our delivery and pickup windows. -Prior day deliveries will be given a call with a one hour delivery window the day before their delivery date. -Same day deliveries will be given a call before arrival that same day. - Your driver will give you a call before arrival for pickup. (We do not give one hour windows for pickups). If you would like an idea of when the rentals will be picked up please call our office that morning. No one has to be home for the rentals to be picked up as long as our staff has access to the rentals (Side gate or rentals left on porch). 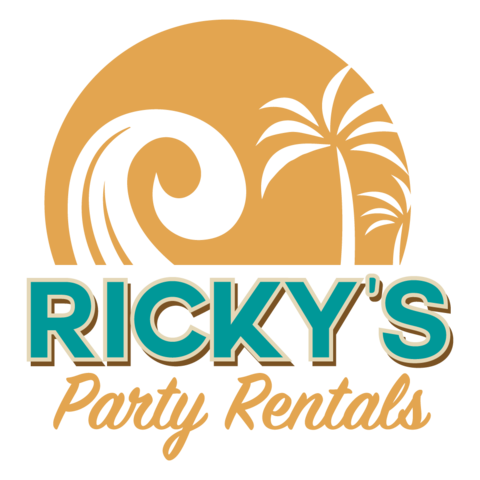 Before the Ricky's Party Rentals team arrives to your event space please be sure of the following. -There is a wide clear path to your desired drop off location. -Set up space for Canopies must be clear of any objects and overhanging power lines/tree branches before delivery staff arrives for setup. -Cash payment is due upon delivery. please have the exact amount due, as delivery staff may not have change. Checks are not accepted. Please contact our office if there are any steps or stairs to get to your setup location. Additional fees may apply. -ALL Tables and chairs must be stacked and folded in the same place as delivered. Teardown fees will automatically be charged for any tables and chairs still setup upon arrival for pickup. Charges will be as followed. -All linens must be clear of any debris and left over food and placed in a pile. DO NOT place wet linen in bags as they can form mildew and you will be billed for damages. -All dinnerware and concessions must be rinsed out and free of any stuck on food or debris. All dinnerware is subject to a $.25 cleaning fee per item if not rinsed out prior to pickup. -All decorations must be taken off Canopies and Tents before arrival for pickup. In the event of extreme weather (Heavy rain, high wind, etc.,) customer and Ricky's Party Rentals have the right to cancel your order (Linen orders excluded). If rentals are left during bad weather lessee is liable for any damaged that may accrue to rental equipment, personal property, or injuries to customer or customers guest.